Do you want to inspire a culture of mathematics in your classroom and school? 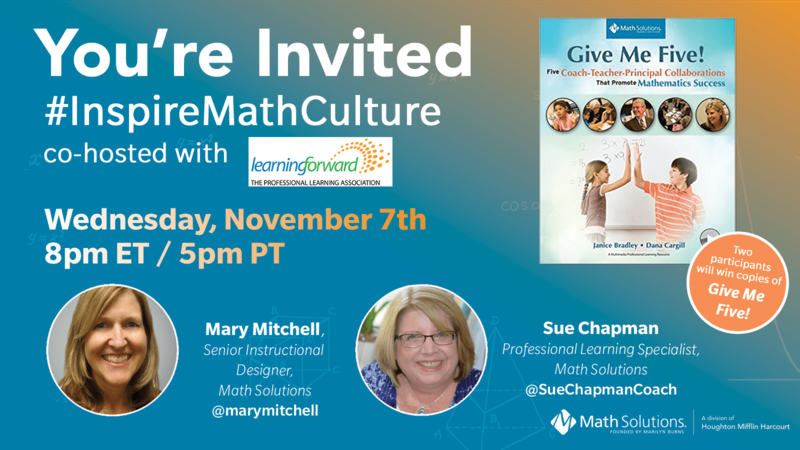 Join @Math_Solutions for a special #InspireMathCulture Twitter chat co-hosted with Learning Forward on Wednesday, November 7th at 8pm ET/ 5pm PT. Mary Mitchell, Senior Instructional Designer, and Sue Chapman, Professional Learning Consultant, will co-lead a discussion on how we support teachers’ mathematical identities and open doors to equity for learners. Two lucky participants will be randomly selected to receive copies of our coaching video resource, Give Me Five. Join us for a lively discussion and build your math community! 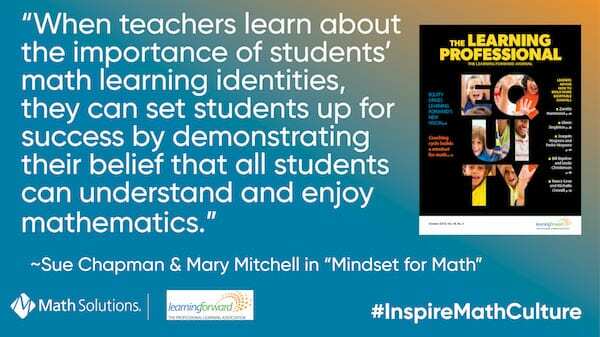 In advance of the chat, be sure to check out Mary and Sue’s article for the October issue of Learning Forward’s The Learning Professional, “Mindset for Math: Coaching Cycle Empowers Students and Teachers”.